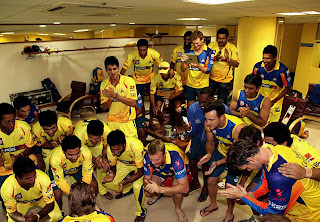 Victory Photos of our Beloved CSK Team after their 200+ Run Chase Against RCB. This is why we love this game and we love CSK Players. Do share these photos with your facebook friends too. Rain plays spoil sport to what should have been an exciting match between rivals Chennai Super Kings and Bangalore Royal Challengers. Just the batting line-up of both the teams made it a mouth-watering contest even for the neturals. Sadly, showers in Bangalore prevents it. 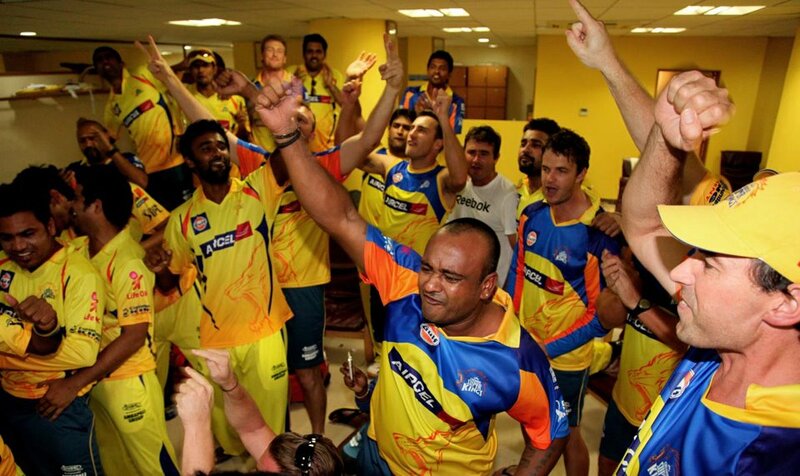 But the good news is that Chennai Super Kings have now climbed back to the top four. Hope they stay there. Though Chennai Super Kings have the best-performing team in the last few years, my wishes are not really high this year. I want them to reach semi-finals once again. I strongly believe this team has potential to win the IPL again this year. But I can see myself - the team repeating the same mistake they did with Flintoff. Rather than addressing the problems of the team (i.e. explosive opening batsman and good Indian fast-bowlers), the team playing so that they can justify the price of Jadeja. Now with a star coming in, CSK has to find the right team composition - before they can start picking up steam. 1. Raina: In every IPL, we are used to see a different 'Raina' and the trend continues. He is crucial in the early matches before others starts picking up pieces. 1. Selection: Really Faf as an opener?? Hope the management does not make mistakes like this again. There were a lot of things to feel unhappy about. Hope Fleming & Dhoni sit together to figure out the winning combination. Who do you think should be in the playing eleven?